Yuka just wanted to have fun. Yuka Saso watches the flight of her ball after teeing off at the start of the ICTSI-Manila Golf Ladies Masters at the Manila Golf Club course in Makati City. 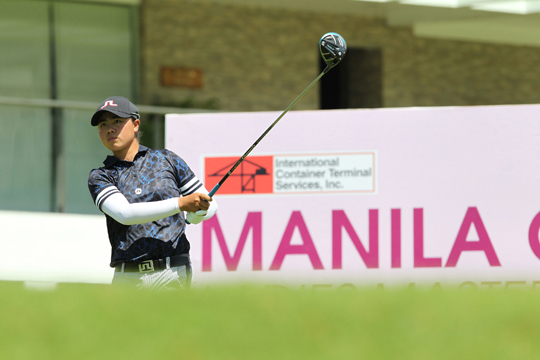 And her relaxed outlook, allowed Saso to birdie four of the last six holes to overtake two Taiwanese rivals in the last three holes and grab the early lead at the start of the ICTSI-Manila Golf Ladies Masters at the Manila Golf Club course in Makati City. The 17-year-old Saso, who had just accepted an athletic scholarship at the University of Georgia, went on to submit a four under 67 after round 1 on the 6,368-yard long course. “Relax lang ako today. I just wanted to have fun. Yun lang goal ko. Yun ang nangyari,” said Saso, who had subpar totals of 36 and 31. She was on equal terms with Taiwanese pros Ching Ling Chang and Hsuan Chen in the last three holes. Ching and Hsuan, who dropped to share of second spot, were supposed to take the early after they both finished with a 2-under par 69. Then two birdies off a 20-foot putt in the 16th, followed by five-footer on the 18th hole, allowed Saso to wrest the lead from her Taiwanese foes. “Maganda naman ang kundisyon ng greens. Pero meron akong holes na di ko matira dahil nasa gilid sila ng greens,” added Saso, who is seeking a slot with the national team that is being assembled for the 30th Southeast Asian Games. She birdied five holes for the day to recover from a bogey in the third hole. After a four-foot putt and nine-foot putt for birdies in the 4th and third, Saso went on to have an even par 36 score in the front nine. But Ching managed to challenge her with a birdie in the fourth hole that allowed her to take a one-under par 35 and a one-stroke lead after the front nine. Chen pulled even with Saso in the first 18 holes with a 36 before hitting a 33 in the back nine. Thai bets Pimpadsorn Sangkagaro, Chommapat Pongthanakarak and Arpichaya Yubol share fourth to seventh places with Singapore’s Sock Hwee Ko with similar scores of 70. Filipina pro Pauline del Rosario is ninth with 71 tally.